Fudge is one of those special kinds of treats. The kind of treats that you associate with summer holidays and quaint British Countryside towns. The kind of treat that appeals to both young and old. 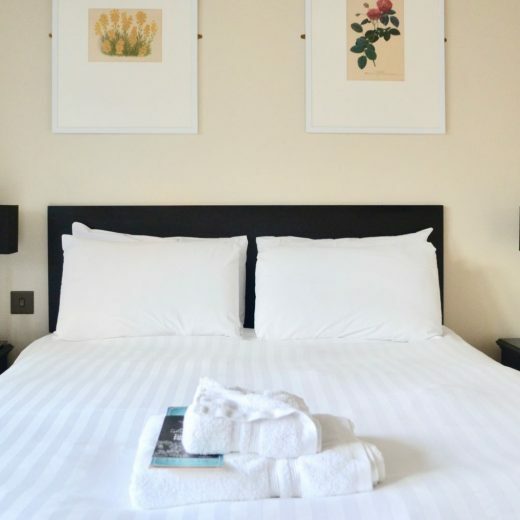 That can be for a celebration or just for a cosy night in with special someone in front of the telly. Making fudge has always been given a bad press. People seem to think that it is dangerous or that its really tricky to get it right, or that it involves sugar thermometers and high-tech things like that – and maybe it does if you are working in a professional Fudge Kitchen, but I’ve been making it for years using just a big bowl and a microwave, and it always turns out right! 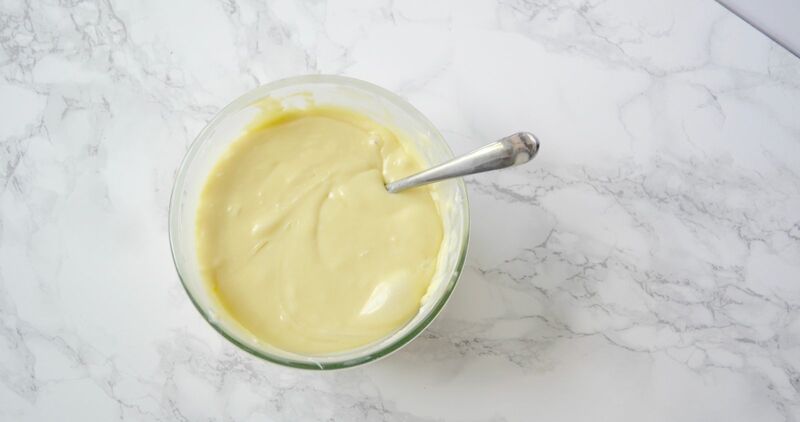 I posted my recipe for “Indulgent Chunky Vanilla Fudge” a little while back (check it out if you fancy – YUM!) 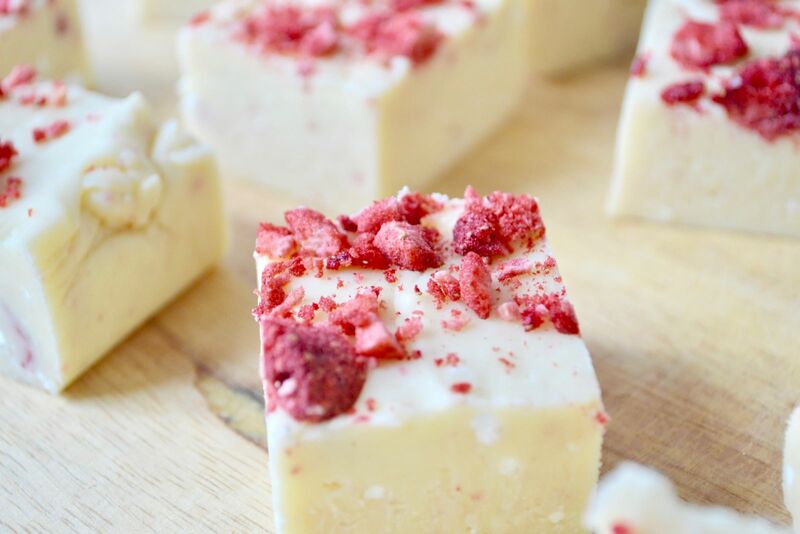 Today’s recipe is for another one of my favourites – White Chocolate and Strawberry. 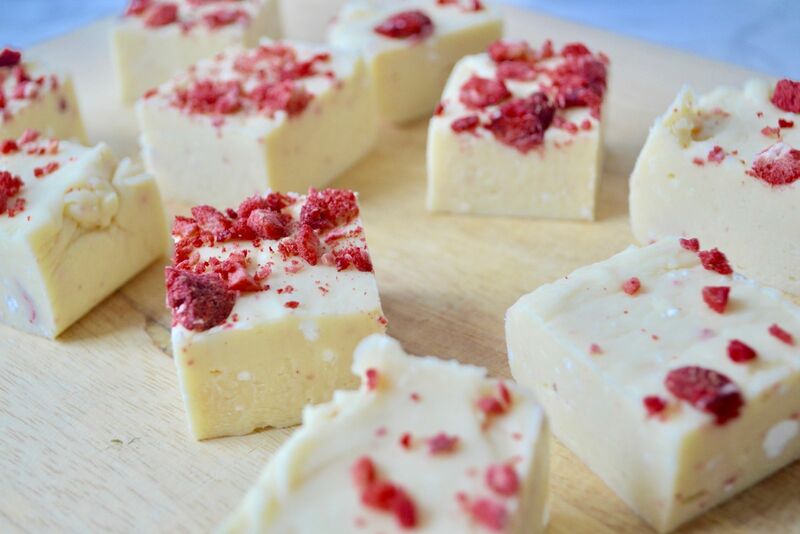 I realise that it’s normally White Chocolate and Raspberry as a combo, but it’s actually much easier to find Freeze Dried Strawberries in the UK than it is to find Freeze Dried Raspberries and the Strawberries work just as well, if not better, so it’s a win-win! 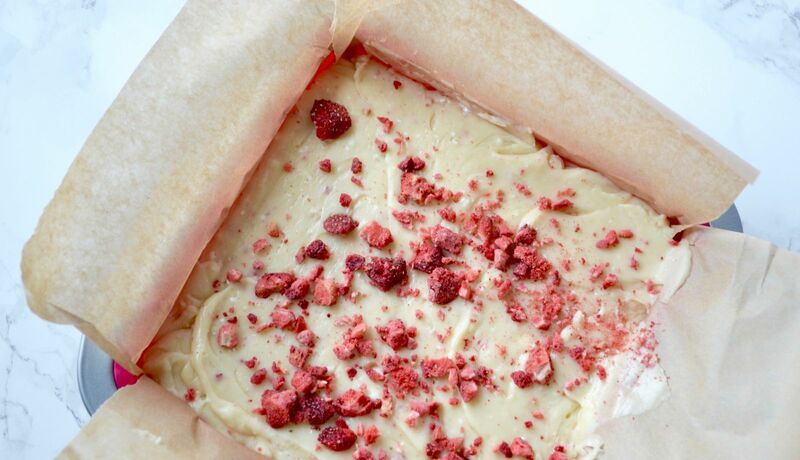 Line the square tin with greaseproof paper. 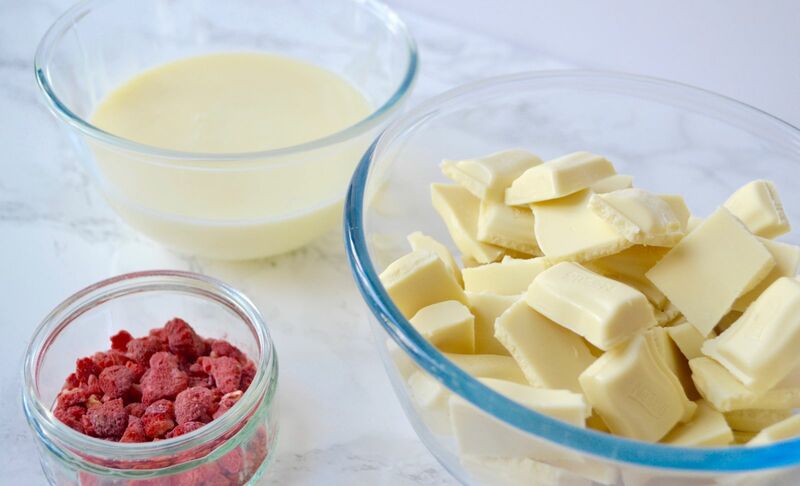 Break the White Chocolate into chunks and place in a the mixing bowl. Add the Butter and Condensed Milk. Place the bowl in the microwave and heat on full power for 20 second increments, stirring each time, until you have a smooth melted liquid. Add half the Freeze Dried Strawberries, sift in the icing sugar and mix through. 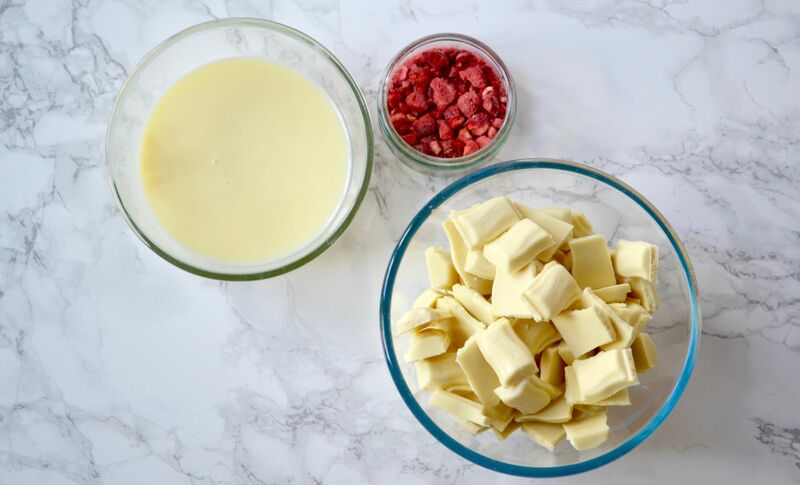 Pour the mix into the tin and sprinkle the remaining Freeze Dried Strawberries on the top. 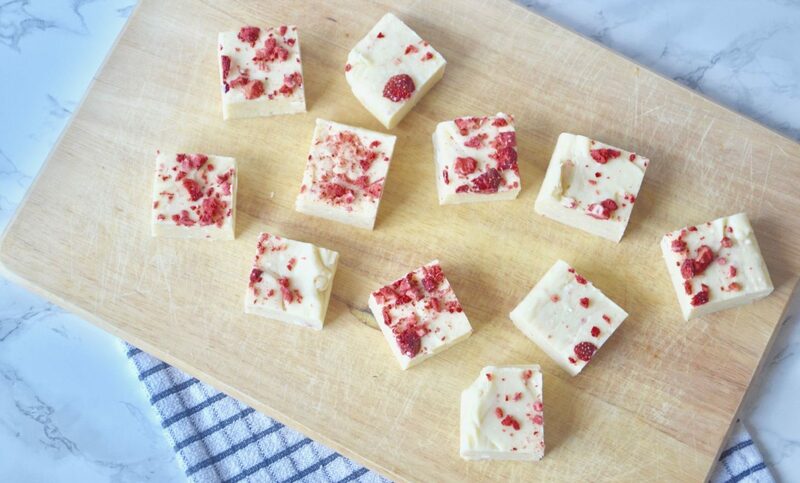 Place in the fridge for at least an hour and then cut into 16 squares. These squares are quite big so you might wish to cut each of these in half, which is what we did. Store in the fridge in an airtight container. 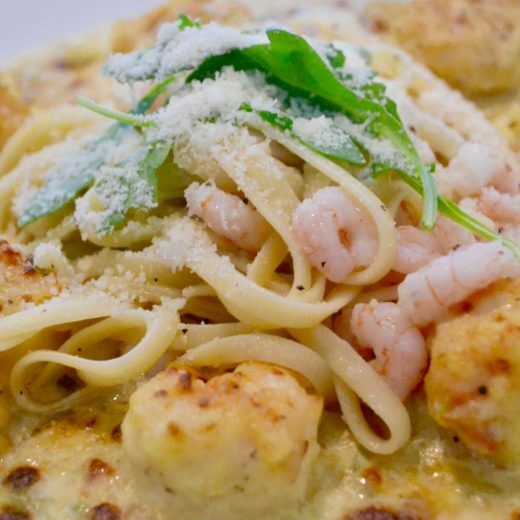 Personally, I think it tastes much better the next day, once it is completely set – it’s a bit rich while it’s still a bit goopy….